iTunes have released a featurette for Daniel Radcliffe’s upcoming film, The Woman In Black. It centres on a lawyer who’s wife has recently passed away so he travels to a village where he encounters a ghost of a woman that wants revenge. This is Daniel’s first film after the completion of the Harry Potter series so this could be the film that forges his career for years to come. From the trailer of this film I got a great impression, I think this could actually be a good horror film which should be good seeing we haven’t had one for years. The Woman In Black is set for a 3rd February (USA) and 10th February (UK) release, I will be sure to check this one out. You can check out the featurette below. Will you be checking this one out? Tell me in the comments below. 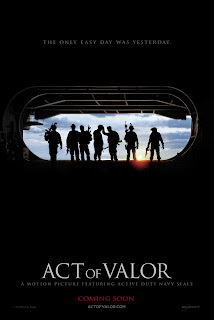 iTunes have released a featurette of the upcoming film Act Of Valor which is one of my most anticipated movies of 2012. The film centres on Navy SEAL operations, surprisingly the film contains no actors as such seeing all the people playing Navy SEAL’s are actually SEAL’s in real life which I think is really cool. Act Of Valor is released on 24th February (USA) and 23rd March (UK) I can’t wait to see this and neither will you after watching the featurette by clicking on the image below.